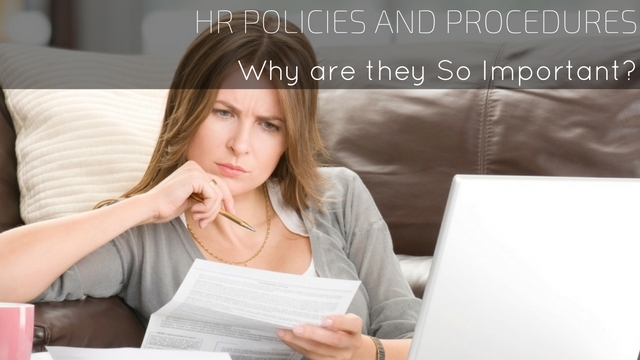 HR Policies and Procedures: Why are they So Important? A HR department or Human Resources Department is an essential part of any company, be it a start-up, or an established company; no matter how big or small the business is. But few people actually understand the importance of HR policies and procedures. The HR department of any company are the people who have been hired as employees of a company to select, recruit, assess new candidates, as well as create the procedures and HR policies of companies. It is not necessary for two companies to share the same HR policies, but it is necessary for the employees to follow the policies and procedures of their own company. So what are Policies and Procedures? A Policy is a formal statement of a principle or a rule which all members of an organization are bound to follow. A Procedure tells the members of the organization how to carry out or implement policy. So while policies are WHAT are to be done by the members of the organization, written in the form of statements or rules, procedures tell the members HOW TO carry out these policies, written in the form of instructions. It can be said that the HR department and its policies and procedures are the real backbone and foundation of a company. As the HR team is responsible for recruiting the right people in the company, and there after managing these people and their needs, queries, and various problems. Without a strong HR team and even stronger policies and procedures, no organization could run smoothly. As every individual working in an organization is different, each individual has their own set of wants, needs, aspirations, problems, and how they plan on fixing these problems. An entire load of all this falls upon the HR department of an organization. Human resource policies are always a must in all types of organizations as they need to cater and meet the needs of all types of people. There are different natured people, not surprisingly all go well with each other. Few people might have a habit of accepting what is the norms, few might want to relax the rules but still written policies have the power to make people stick to the regulations of the organization. Here are few most common reasons why any kind of organization needs HR policies and the main purpose of a HR policy. 1. HR policies are not only for effectively drawing rules for employees but also to recognize their needs, respect their thoughts. 2. HR policies are needed because every individual has a different opinion on all things. Not all need to accept others view. Hence, HR policies will make everyone respect and follow same rules. 3. A well-written HR policy will reduce the conflict among employees as well as help the higher officials in the organization to take correct decisions based on the official rules and regulations. 4. A good HR policy will not only maintain the wellness of the organization inside but it also will create a good corporate image among the society as well as job seekers too. Even before employees are hired into a company, the HR team must sit and draft out its set of policies and procedures. It is these policies which every employee of an organization is bound to follow, in order to assure harmony in the organization. There are four major key elements that an organization must keep in mind when drafting out their HR Policies and Procedures. These major elements are: Roles, Rules, Consequences and Tools. One of the first most important tasks of building an HR policy is to have a clear formation of employee Roles. Role definition is a crucial part of establishing clear performance expectations from employees. Each and every employee in an organization must be clear about his role and how much he can exercise his powers within his role. Only when role definition is made clear to each employee, that he will know what exactly is expected of him, and what he can expect from the company. If an employee’s role is not made clear to him, he may exercise rights which are beyond his powers and jurisdiction. In every workplace, employees and employers need to share a clear and mutual understanding of what is acceptable and what is not. Certain people feel it is essential to have clear, written rules in every organization, while others are more comfortable with having no set of rules. If we took the case of the latter, this would mean having no discipline and no punishments for wrong behavior or action. You might fall victim to the effects of someone else’s bad behavior, and without any clear set of rules and policies, that person could not be held responsible for his actions. This would have a derogatory effect not only on the people working in the organization but also on the organization as a whole. On the other hand, if an employer relies on a loose set of rules which have not been documented; it is easy for people to assume these rules are open to interpretation. The result would be a working environment which would be out of tune with the ultimate goal of the organization. Every individual in an organization has their own set or principles, morals and ethics. Is it not necessary that two people working under the same roof would share a set of values. But when this set of people join together to work in a professional environment, and if they are each allowed to exercise their perceptions of right and wrong behaviour, chaos would surely ensue. In order to keep the workplace a professional and pleasant environment, certain set of rules or policies and procedures are made. Even with formal documentation, certain people have a tendency to test their limits. To prevent exactly this from happening, along with the set of policies and procedures, the company must also decide beforehand what their policy towards employees exhibiting bad behavior is. The company head must sit with the HR team and decide what they consider over the line behavior, or inappropriate behavior. Not only that, they must also decide what the appropriate consequences of these behaviors should be. After these are decided, it must be explained to all employees, so that each employee is aware of their roles, the rules and regulations of working in the company, what appropriate and inappropriate behavior is, and how the company will deal with inappropriate behavior. Ground rules must be set out, employees must be told what behaviors might lead to immediate termination. Consequences for inappropriate behavior, while it may sound harsh to some, are the only way an organization will be able to succeed. This ensures that their best employees are retained, and their new employees are well trained to be an asset for the company. In order to build a good company, it is essential for employees to be able to work together peacefully. This is attainable by having a proper set of policies and procedures in a company. Tools are defined as the resources you provide to the employees in your organization who are incharge of managing other employees. Whether you have provided them with the employee handbook, company policy manual and procedures guides, and simple forms to use when faced with problems such as inappropriate behavior from an employee. Providing in-house training or even hiring experts to provide training to employees regarding work culture, policies, how to address issues and grievances, and correct training on appropriate and inappropriate workplace behavior should be provided. These tools, if provided before hand to employees, will help save a lot of productive time and resources when dealing with rules and regulations and consequences of wrong actions. Human resource policies and procedures can differ from organization to organization. Yet, they are simple, straight forwards ground rules which every employee of an organization must abide by. The HR policies provide guidelines on employer-employee interaction, behavior, appropriate work behaviors, work schedules, employment laws, conflict resolution, disciplinary measures and health and safety measures. These policies and procedures are what provide foundation and structure to any organization. The HRM policies and procedures of an organization are made to comply with the laws and regulations of a country. These HR policies and procedures are made to prevent lawsuits as far as possible, in case of problems faced as the workplace. Employees are required to be informed about these policies and procedures and their legal implications to ensure smooth operations in an organization. HR policies and practices provide employees with the right tools, guides and resources on how to manage employee and employment matters in an organization. This greatly helps organizations streamline their workflow and run like a well-oiled engine. The HR policies and procedures allow supervisors and managers to train, guide and manage new or existing employees. They also provide formal guidance on how to manage grievances at the workplace. HR practices, policies and procedures help an organization in maintaining consistent practices in the workplace. Consistent application of HR policies and procedures help prevent dissatisfaction amongst employees, as sudden changes in schedules, benefits or roles and responsibilities can create an unhealthy working environment. Why Develop an HR policy? Help employees and employers run the organization in a smooth and efficient manner. Help take human resource decisions, make and manage policies and hr guidelines for the employees of the organization to follow. Documenting all organizational policies and procedures, rules, regulations, communicating the same to the employees. Saves countless hours of productive time and funds. Defines management hr standards for making decisions on various organizational as well as personal issues. Protect the legal interest of the company as well as define the legal obligations of the employees towards the organization. The following points show us why are policies and procedures important for human resource management process. HR policies and procedures ensure every employee of the organization is looked after; his needs respected and proper benefits are given to them for their work. They help address complaints, problems and grievances of employees and solve them appropriately. They protect employees from wrong behavior from other employees or even from the organization itself. Helps train and develop employees who are consistent with the needs of the organization. Helps employees receive adequate compensation. Helps maintain discipline in the workplace. Provide paid vacations and holidays to eligible employees. How Do You Effectively Communicate HR Policies and Procedures to Employees? Make sure the written documentation or guidelines made by the organization are easily understood by all employees to avoid inconsistency and confusion. Ensures all managers and supervisors are well trained and able to provide training to new employees as well. Ensure all employees and employers are properly trained in appropriate and inappropriate workplace behavior and work culture norms. Periodically review the policies and guidelines to ensure they are appropriate and up to date. Guideline of the recruitment and selection process of new employees, as well as their orientation. Provides access to individual employee accounts, personal files, background checks and performance reviews. Written terms and conditions defining employee benefits such as paid leave, insurance, holiday and employee reimbursements. Policies related to employee salary and wage, deductions and advances. Guidelines defining work arrangements like conveyance, flex time and use of company assets. Defining appropriate workplace behaviors and norms, conduct of employees, preventive measures to check substance abuse, harassment and workplace violence. These are guides informing employees on proper usage of the organizations information and fair use of the internet. Human resources are responsible for all the functions of advertisement, recruitment, selection, training and development of an organization. Recruitment, selection and training of new employees are done based on the HR policies developed for the company. Human resources team members are responsible for conducting proper market survey and job analysis to determine adequate compensation of employees. Performance review and job evaluation are also conducted by the human resources team in lines of the HR policies so as to provide standardization and unbiased reviews. The HR policies do not state the quantitative measurement of compensation, employees must receive; but they state that each employee must be adequately compensated for his\her input. HR policies include the tools and resources available to the employers to provide proper training to employees. They also help new employees as well as old employees get enough assistance in case of added responsibilities. HR policies contain guides and information on grounds for termination of employees. These policies help protect the organization from harmful employees. They also provide clear cut ground rules for the violation of any company policies or rules, which call for corrective measures, or in the worst case scenario, termination of the contract of an employee. While HR policies and procedures may be developed in every organization, it is eventually up to the staff members and employees to put them into action, and provide a safe working environment for all.